In February and March we like to inspire ourselves fashionwise for the upcoming cold days after a much-wanted summer full of sun. But if we have a look at the current temperatures, some of the fall trends could easily move into our closets already. After New York and London, the fashion week in Milan has also come to an end, whereas we’re still excited for some designer’s collections in Paris. In these metropolises women’s power was the big theme, which inspired many designers for their work. Especially Milan has really embraced diversity on the runway and a cast of young people from all over the world brought much joy to the shows of Missoni and Salvatore Ferragamo. Gucci and Prada both scaled down the size of their shows but enhanced the personal bonding to the audience by putting up immersive sets in the smallest spaces like an operating theatre at Gucci. After the previous edition of the Must-Know-Trends, the following four trends are dominating the runways in Milan and Paris and will surely soon be spotted in many street style looks. The dutch trend forecaster Lidewij Edelkoort strikes again – just like she anticipated, brown will be the trend color of this fall, instead of black. “Black was truly abused by many brands and utilized everywhere”, Edelkoort said in an interview with welt.de. “In addition, brown has something really earthy and people these days have a strong urge to feel connected with planet earth.” There is indeed a huge list of designers who’ve involved different shades of brown into their collections. Even Yohij Yamamoto, who is famous for his preference of black, included brown short leather jackets and boots into his show. At Salvatore Ferragamo, Paul Andrew and Guillaume Meilland showed that brown can easily be worn by both men and women, even in the form of an all-over look. The color was seen as suits, dresses and coats at Lemaire and provided the whole collection with some kind of laissez-faire feeling. Finally, Altazurra presented a very elegant way to wear brown by showing straight cutted blazers and vests. These boots are literally made for walking! Again, the designers in Milan and Paris showed us that boots – just like every fall – are an absolute must-have. The Models wore them on the runways in every color, shape and size and proved that you could look elegant, even by wearing wide and bulky boots. In Milan, Tod’s presented suede crepe-soled wedge boots in different shades of brown. The brand, that made its name with driving shoes, relied on practical footwear, perfect for having a walk through the yellow and red leaves on the ground. 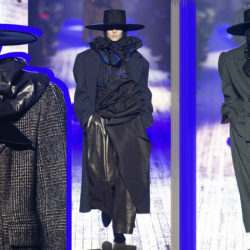 French designer Isabel Marant labeled her collection as a “Modern interpretation of the classic Western”. And which part can’t be missing in any good Western movie? Cowboy boots, of course. Her popular thigh-highs were reinforced with a metal toecap to look a little bit more western-like. Virgil Abloh also presented another kind of boots for his label Off-White: Bella Hadid walked down the runway in light blue riding boots with snake pattern in combination with a skintight jumpsuit and a white shirt underneath. Slightly different was Miuccia Prada’s interpretation of a solid pair of boots. Practical and waterproof garments made of materials like Nylon characterized Prada’s collection. Therefore, the models were sent over the black-mirrored floor in knee-high rubber boots. The maxi bag trend isn’t passé yet; therefore the designers are coming up with different styles of the XXL bags frequently. Because of that the customers are never getting bored but fascinated by these huge bags, which truly catch attention. They are particularly practical because they fit a whole lot more stuff in them than their counterpart, the micro bag, which only has space for a smartphone and some cash money. Especially Gucci went for the maxi bags as a relevant accessory this season, besides the baby dragon or chameleon, which were entering the runway. Artistic director Alessandro Michele doesn’t distinguish between men and women in his clothing lines as well as in his accessories, thereby these bags are becoming unisex. Tod’s combined the leather maxi bags with boots and US-Vogue editor in chief Anna Wintour herself views this combination as an expression of freedom and movement. Bags and boots are symbols for a strong woman, who is ready to head out into the wide world. Even Karl Lagerfeld designed a collection for powerful women for Fendi with combining the statement-bags with clear-cut coats, which are emphasizing the shoulders and boots. 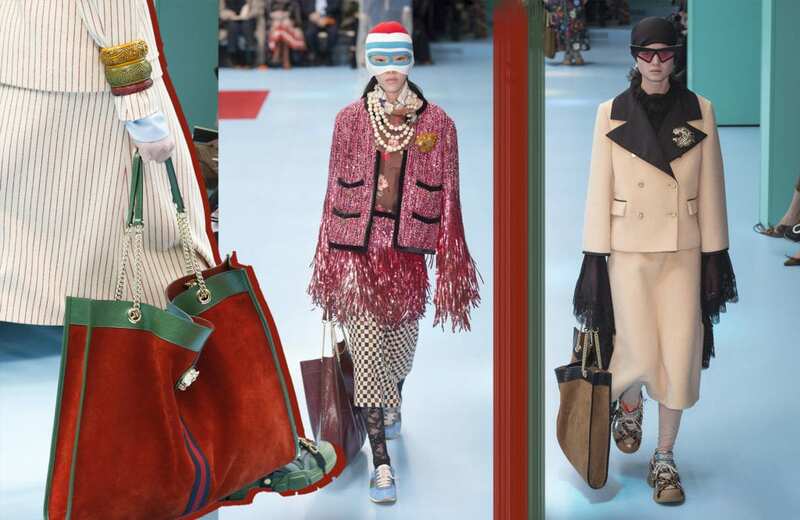 However, Miuccia Prada adapted her bags in bright colors to the rest of her by work gear inspired collection. The Sixties-decade is famous for its modish and social changes. Women wanted to live free and independent lives, the youth was determining the fashion industry and Mary Quants mini skirt finally was accepted by the public. All eyes were on fashion icons like Marilyn Monroe, Audrey Hepburn and Jackie Kennedy. Latter, Kaia Gerber embodied on the Moschino runway. The model brought the Sixties back to life when she was walking the catwalk in a bright orange costume and a pillbox hat. As a result, the audience couldn’t miss which decade served Jeremy Scott as an inspirational source. Bright colors like green, pink and orange, as well as dresses with comic prints were recalling pop art masterpieces. Also, some other designers like Haider Ackermann and John Galliano for Maison Margiela let their clothes shine in loud pop art-colors. Another eye-catcher was a calf-length raincoat in Yves Klein-blue, designed by Francesco Risso for Marni. A big white waist belt formed a strong contrast to the plain coat. While some looks at the Undercover show in Paris were held in one color from head to toe, Prada combined multiple colors or did just put an emphasis with a bit of color added to plain outfits. Missed the first part of the Must-Know Trends? Don't worry, just hop back to the previous edition and make sure your wardrobe gets ready for fall 2018! 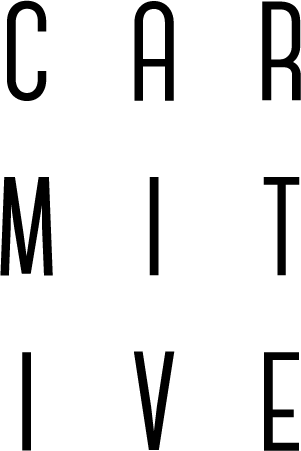 Posted in News and tagged Fashion Week, Inspiration, Lifestyle, Milan Fashion Week, Musthaves, Paris, Paris Fashion Week, Style, Things to love, Tips, Trend. Bookmark the permalink. Great post and amazing roundup. Though, I don´t like the brown so much. I think I´ll still prefer the black. This color works for me in every situation). Awesome, love hearing about the new trends! Loving all the boot styles! OMG the boots that have been on the runway this season were INSANE! Love them and can’t wait to see them translated into street style! Danke für die Zusammenfassung der Trends! Ich muss ja sagen, ich finde denn Allbrown Trend richtig cool! There is no makeup that is good only for a few. We just need to find the right way to wear what we are less used to. Ich werde den Braun-Trend diesen Herbst auch auf jeden Fall ausprobieren 🙂 Habe bisher viel zu wenig in dieser Farbe in meinem Kleiderschrank.. Loved this inspiring post!! I am super fond of the brown trend as well as the maxi boots ♥ Thanks for always keeping me up to date with the latest trends! great roundup – my favourite thing to do during fashion week is to get inspired (obsess) over street style looks! I enjoyed this so much! It made me feel like I was there myself. Amazing fashion! This is so informative hun, thank you so much for sharing.